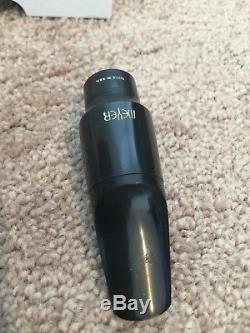 Up for sale is a custom Meyer by Phil-Tone, a modern jazz alto saxophone mouthpiece in excellent condition (just some slight teeth marks as pictured) with a tip opening size of 5. Per Phil's website, The Phil-Tone Meyer is a corrected and customized version of the current Babbitt Meyer. The table is flattened, the throat is slightly enlarged, and a proper facing is applied for ease of play and rapid response. The result is a classic mouthpiece with a rich tonal palette that is never shrill or thin. Expect deeper lows, a strong midrange, and highs that project with clarity and resonance. It comes with all of its original packaging. If you have any questions, please feel free to ask. 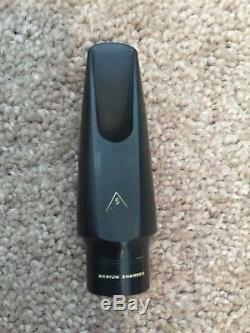 If you are interested in other modern jazz or classical mouthpieces, please give my other listings a look. The item "The Custom Meyer by Phil-Tone Alto Saxophone Mouthpiece Size 5" is in sale since Monday, January 08, 2018. This item is in the category "Musical Instruments & Gear\Wind & Woodwind\Parts & Accessories\Other Accessories". 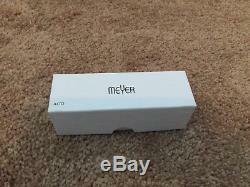 The seller is "rben20" and is located in Houston, Texas. This item can be shipped to United States, Canada, United Kingdom, Denmark, Romania, Slovakia, Bulgaria, Czech republic, Finland, Hungary, Latvia, Lithuania, Malta, Estonia, Australia, Greece, Portugal, Cyprus, Slovenia, Japan, China, Sweden, South Korea, Indonesia, Taiwan, Thailand, Belgium, France, Hong Kong, Ireland, Netherlands, Poland, Spain, Italy, Germany, Austria, Russian federation, Israel, Mexico, New Zealand, Philippines, Singapore, Switzerland, Norway, Saudi arabia, Ukraine, United arab emirates, Qatar, Kuwait, Bahrain, Croatia, Malaysia, Chile, Colombia, Costa rica, Panama, Trinidad and tobago, Guatemala, Honduras, Jamaica, Antigua and barbuda, Aruba, Belize, Dominica, Grenada, Saint kitts and nevis, Saint lucia, Montserrat, Turks and caicos islands, Barbados, Bangladesh, Bermuda, Brunei darussalam, Bolivia, Ecuador, Egypt, French guiana, Guernsey, Gibraltar, Guadeloupe, Iceland, Jersey, Jordan, Cambodia, Cayman islands, Liechtenstein, Sri lanka, Luxembourg, Monaco, Macao, Martinique, Maldives, Nicaragua, Oman, Pakistan, Paraguay, Reunion.